Send a strategic message of support for our troops, veterans, and chaplains on the Sunday before Veterans Day, November 9, by using a bulletin insert provided by the Eagle Commission and Grace Brethren Investment Foundation. PDF files have been provided, either color or black and white in a format, for printing as bulletin inserts. The Eagle Commission provides support and encouragement throughout the year for our Grace Brethren Chaplains, their families, and the brave men and women in the U.S. Armed Forces who wear our nation’s uniform, often in harm’s way. Consider becoming an official “sponsoring church” of the Eagle Commission by donating a suggested amount of $500 or more to the Eagle Commission. Receive monthly letters of news and prayer requests from our Grace Brethren Chaplains. 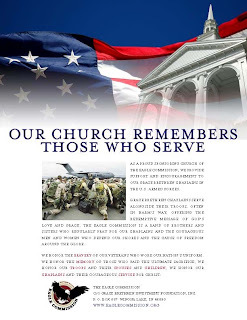 Each sponsoring church will receive a poster for display throughout this next year that demonstrates the congregation’s support for our troops, veterans, and chaplains. For more information or to register your church as a “sponsoring church” of the Eagle Commission, please contact Larry Chamberlain, president, Grace Brethren Investment Foundation, the proud sponsoring agency. Click here for color poster (PDF file). Click here for two-up color bulletin insert (PDF file). Click here for two-up black only bulletin insert (PDF file).